How can we get the most out of our 401k plans? Ignoring articles that claim they’re a scam is the first step. Participating in your company 401k plan is a must if you’re serious about saving for the long term. Take these steps to make sure you’re not missing out. This can be hard to do but there’s an expression that nothing worthwhile is easy. If you’re not saving 10% of your pay, ease into it. Many 401k plans will allow periodic increases. Easing into it will limit the shock to your budget. If you’re a high income earner, contributing 10% of your pay may not be an option due to the allowable limits. 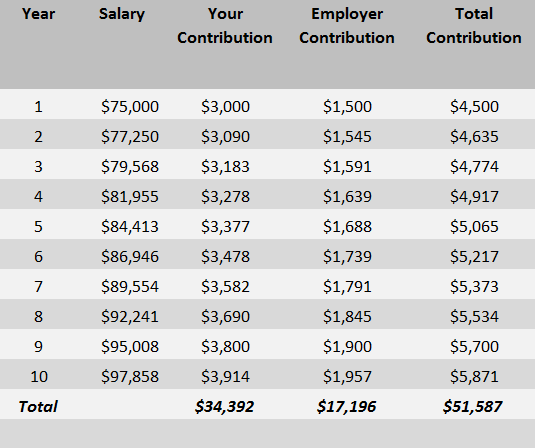 In 2019, the salary contribution limit is $19,000 ($25,000 age 50 or older). Contributing the maximum allowable is the ultimate goal. They might say 3%, 4% or 5% but whatever the percentage, contribute at least that amount. If you don’t, you’re leaving money on the table. Consider what you miss out on when you don’t take advantage of matching. Below are two scenarios where the employer provides matching based on what you contribute up to a maximum of 4% of compensation. In isolation, they don’t appear that significant. However, over time, the numbers add up to a lot! Many 401k plans offer investments that can be quite risky and it can be tempting to make aggressive investments when recent market returns have been good. When it comes to retirement funds, slow and steady wins the race. Timing the market increases the risk of loss. Rather that betting on a hot fund, create a diversified mix of investments that is appropriate based on time until retirement and risk tolerance. If you don’t have an adviser to help you select investments, many 401k plans offer target date retirement funds. If you don’t know what portion of your 401k is yours if you left tomorrow, find out! Vesting schedules are important because like employer matching there are various types. The vesting schedule will show you how much of the employer contribution you’re entitled to keep based on years of service. Not being aware of this can cost you thousands of dollars and hurt your retirement next egg. If you’re planning a job change, make sure you know exactly what you’ll lose. Keep an eye out for notices the employer provides. Some employers opt for a Safe Harbor form of matching. This simply means they are following an approved formula to provide matching contributions which give them relief from more complicated and burdensome testing rules. If you receive safe harbor matching contributions from your employer, you are 100% vested in those dollars. Stated another way, you don’t have to wait a period of years before you could access 100% of the funds. Find out if your company retirement plan has Roth provisions. 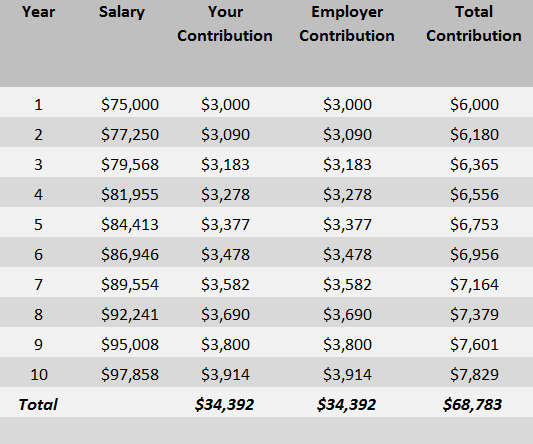 This add on to a 401k retirement plan allows employees to make salary deferral contributions that are after-tax (as opposed to typical pre-tax). You won’t receive a reduction in your taxable income now, but you’ll be able to make withdrawals tax free during retirement. Your employer matching will still be pre-tax, but you’ll now have a “tax free” bucket to to tap into during retirement. Predicting future tax rates involves crystal balls so rather than trying to guess, look at this as tax diversification. This can be especially attractive for younger workers who are just starting out an may be in a lower tax bracket. Why is this important? Everything you put into a traditional 401k will eventually be taxed. That may not seem like a big deal now, but it will be in the future. There is a big difference between tax-deferred vs. tax-free and many people don’t appreciate the difference until it’s too late. If you’re in a lower tax bracket now, the benefit of reducing your taxable income is less than if you’re in a higher tax bracket. The opposite is true if you’re currently in a high tax bracket. A big part of managing your 401k is making sure your investments are in line with your risk tolerance, investment objective, and time horizon. If you built a moderate portfolio two years ago, it is likely that your riskier investments (stock funds) have risen in value. Because of this, your 401k may be out of balance and you may be taking on too much risk. This will also help you stay focused and avoid making snap decisions based on what is currently going on in the market. The same can be said when markets are on a decline. Re-balancing your portfolio isn’t just for bull markets. Increase your retirement account contributions each year. I call this giving yourself a raise. If you make a conscious effort to increase your savings rate each year, you will be doing yourself a huge favor. It can be hard to hit the annual 401k maximum of $18,500 each year. If you make it your goal and take gradual steps, you will be there before you know it. Many 401k plans allow participants to take loans. If your plan does, proceed with caution. Taking a loan from your 401k can seriously derail your retirement plan. I wrote in more detail about this in an article called 401(k) Loans: 3 Reasons Not To Borrow. Some 401k plans allow investments into the company’s stock. In addition, many plans offer their matching dollars in the form of their stock. Putting money to work in a single stock is riskier than spreading it out to a broad basket of stocks. I wrote an article called Diversification Isn’t Enough that goes into a little more detail on this subject. By making recurring contributions, you would be implementing a dollar cost averaging strategy. This allows you to accumulate shares and build your position over time. You would be buying at regular intervals over time regardless of whether the stock is up or down. I did a short video on this called Dollar Cost Averaging. Doing a one-time initial investment is riskier because you’re using all of your ammunition at once and presumably, wouldn’t be able to buy more shares if the price dropped. Make sure you have designated a beneficiary in case something happens to you. Review the beneficiaries to assure they are up to date. Calling your investment provider or contacting the retirement plan administrator can be an easy way to see who is listed as a beneficiary. Also, many retirement accounts allow the selection of a contingent beneficiary in case something happens to you and your primary beneficiary at the same time. A quick phone call can make a big difference for your loved ones financial future. There is always room for improvement so don’t neglect your 401k. Take some time to look into these aspects of your retirement plan. You don’t need to be an expert to tackle these items. You can make these adjustments a little at a time. Do you have questions about 401k plans? My company offers their stock as an option in our 401k – and I avoid it altogether. It has performed better than the stock market in general over the last year or two, but I don’t like having all my eggs in one basket, so to speak. I guess I can’t blame them for having it as an option, though. Thanks for your input on this. I had it in my 401k when I got my first job. It’s definitely not a bad thing, but many folks over do it on company stock. Any more than 20% of your total and you’re playing with fire.